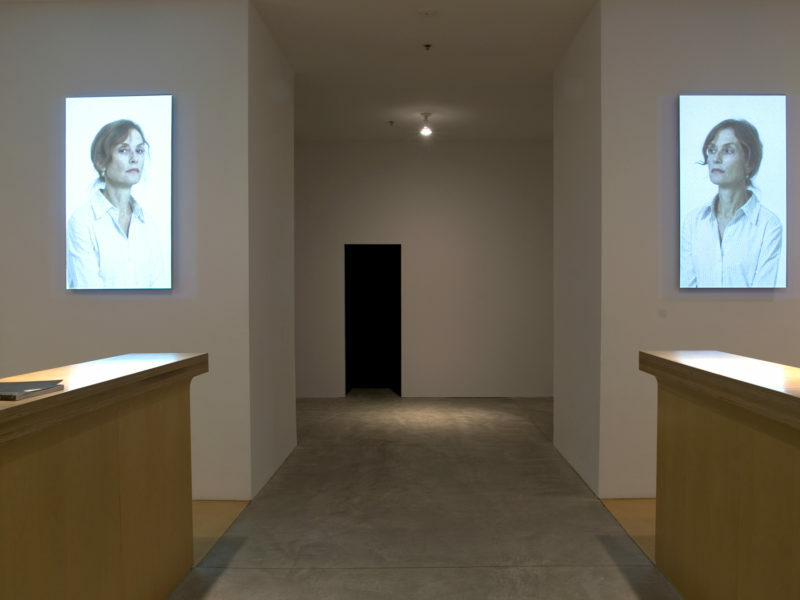 Together with another work entitled Is a Bell Ringing in the Empty Sky, 2005, Loop Through was originally produced for a retrospective tribute to the actress Isabelle Huppert. 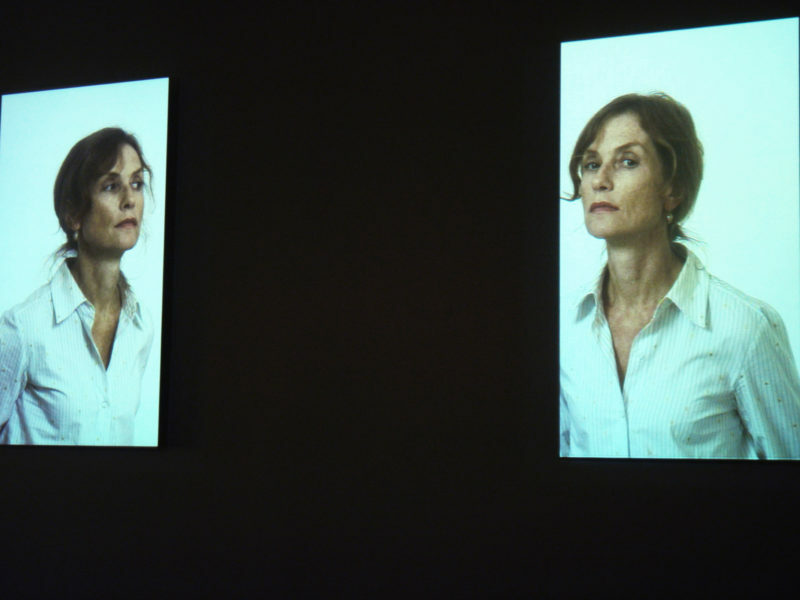 The work was recorded in high-definition video using a vertical format (the cameras were rotated 90 degrees), and is shown on two vertically mounted 40-inch (size variable) LCD monitors, reflecting the fact that Isabelle Huppert is filmed only from the waist up, rather than the entire standing figure. 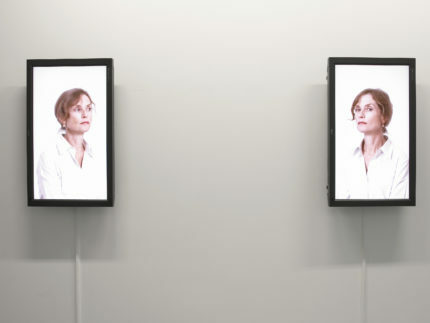 The monitors are positioned considerably apart to reflect the position of the cameras during the recording (in which the position of Huppert and the two cameras roughly formed an equilateral triangle). The person/actress is always looking at one or the other camera, sometimes turning her head to do so and other times simply shifting her eyes. 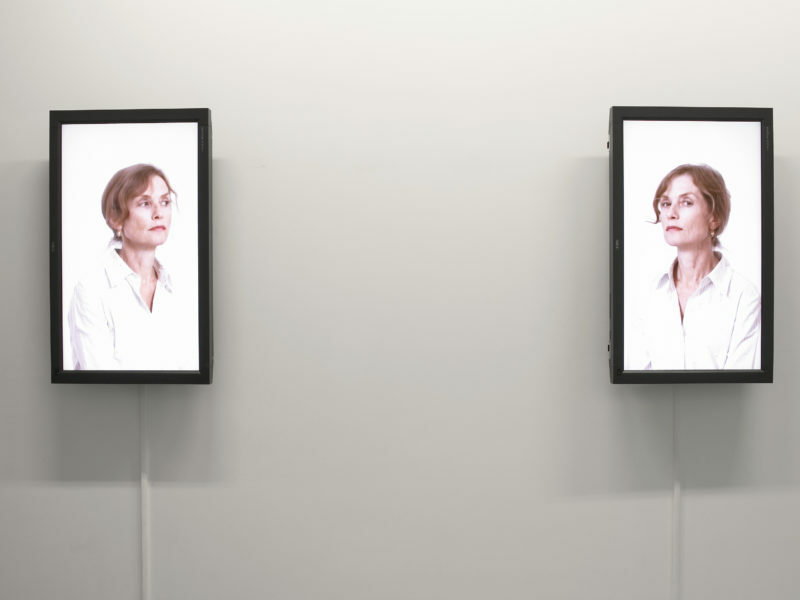 This creates a triadic relationship between the viewer, Huppert, and, in a sense, her double. (In this respect, this piece is quite similar to a previous work entitled Standing Apart/Facing Faces, 1996.) As in Is A Bell Ringing in the Empty Sky, there are fluctuations between the ‘person’ and the ‘actress;’ however, the subtle presence of the ‘actress’ reveals itself to a greater extent in this work through facial expressions, in particular the eyes. Art 39 Basel / Donald Young Gallery, Basel, Switzerland, June 4 – 8, 2008. Bélisle, Josée. “Gary Hill.” Magazine of the Musée d’art contemporain de Montréal, 19, 1 (Summer 2008), pp. 7 – 8. Quasha, George and Charles Stein. An Art of Limina: Gary Hill’s Works and Writings. Barcelona: Ediciones Polígrafa, 2009, pp. 48 – 49, 272, 437, 444, 582, 584.